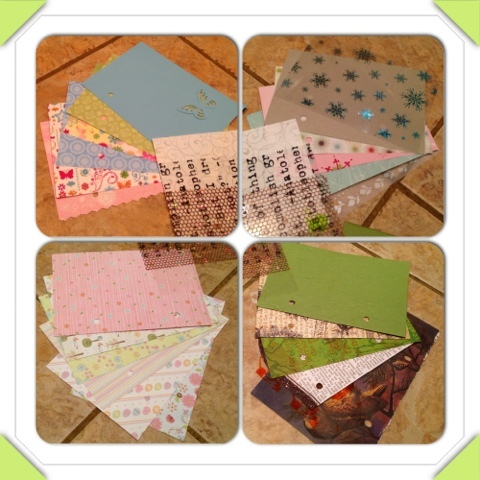 A little preview of my raw album before any embellishments or decorations. All of the papers have been laying around in my stash for sometime as you can probably tell but I'm hoping that as the book comes together and pages fill up it will have a more cohesive look. I am a little concerned that spring, summer & winter are all co-ordinated and that autumn stands out completely but the autumn pages are some of my favourite papers and if I don't use them now I never will. In the middle you can just see a few pages in neutral colours, these are a few filler pages which I'm sure I'll use, I also have no doubts that other pages will find there way in here too! The winter pages will be split into dec, jan & feb so they won't all be together but thought it was easier to photograph whilst they were in a group. 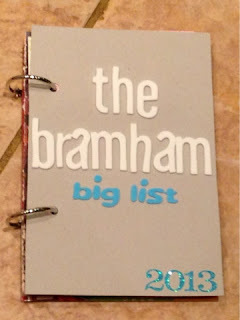 The cover didn't come out quite as expected, as I was supposed to call it 'the bramham's big list' but I didn't have any smaller white letter stickers and the idea for this project was to use up existing stash, I think it's turned out ok and if I decide further down the road to change it I will and that will be fine! What you can't see is that the cover is made from a cereal packet, I love the shade of grey that's on the inside, not sure how and what I will do to cover up the inside but you'll be the firsts to know!! 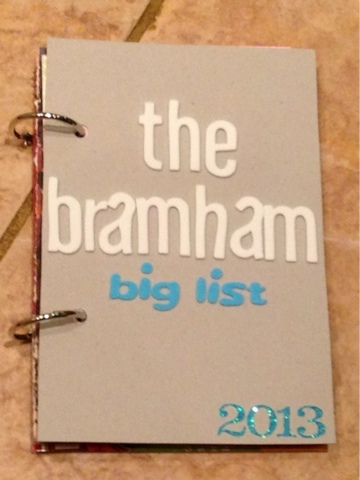 I am so looking forward to filling this book with our adventures into new things, traditions and experiences and watching it grow. I expect that the rings will be placed with larger ones and there will be little peeks hanging out from every side as the journey progresses.